If you want a clear indication that the industry’s lost touch with the average movie-goer, consider the praise being heaped on this lumbering lump of a movie. This is a predictable story told thinly and stretched beyond its point of purpose. Like the sport of wrestling that’s at its center, it goes around, trying different “holds” until the bell rings and someone must be declared the winner. Hint: it’s not the audience. Yes, the performances are remarkable – but mostly because they’re against type – Carell is unrecognizable in this deadly serious role; Ruffalo disappears behind his short haircut and oversized glasses; and who knew that Tatum could actually act? Yet, we should expect more of this true and troublesome story of two brothers — and the bizarre and wealthy man who came between them to change their careers and their lives forever. But, the characters lack depth, the plot lacks breadth, and this dark and depressing story could not possibly have been told more slowly. To say the film is underwritten – and under-energized — is an understatement. We keep waiting for something more to happen. 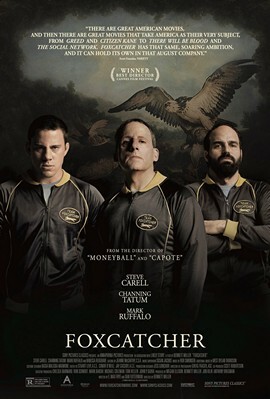 We keep thinking there must be a reason for director Bennett Miller (“Moneyball”) to keep us in suspense. We keep hoping this movie might find a sense of humor or humanity or rhythm; that it might actually get better. Sequences suddenly run entirely silent for no good reason. Scenes go on long past their “best-by” dates. The screen goes black for longer than necessary. It’s as if cast and crew have nodded off. When the violence comes, it’s a shock and maybe even a surprise, but it’s also a relief because we know the end must be near. Finally, a story that has taken two hours and ten minutes to tell – and is about two hours and nine minutes too long – is coming to an end. The match is over; we can go do something productive. Perhaps see a better movie.